Title: "Early Check: A Statewide Fragile X Newborn Screening Project"
The team will present about Early Check, a research project that will offer voluntary newborn screening for fragile X syndrome to all babies born in North Carolina. Title: "Beating Stress and Improving Coping in FX Premutation Carriers: The Role of Mindfulness and Acceptance"
Dr. Wheeler will present results from her Stress, Coping, and Mindfulness survey that was conducted with OFXW families last year. Title: "Involving Individuals with Fragile X Syndrome in Research: Strategies, Tips, and Lessons Learned"
Dr. Raspa will share lessons learned from including adults with FXS in focus groups and a survey designed specifically to ask about their preferences towards research. In addition to presenting our results, we will also be offering exciting research opportunities for families and individuals with FXS! For the first time, we have opened enrollment into the Our Fragile X World registry for adults aged 18-40 with the full mutation so that we can better understand their views, not just those of their parents. We will also be sharing information about new studies that are starting soon. We invite you to visit our booth at the conference and stay connected with us by signing up for our registry and subscribing to our quarterly newsletter. If you won't be at the conference, you can still sign up for the registry or subscribe to the newsletter on our website. 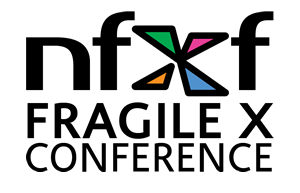 For more information about the 2018 NFXF International Fragile X Conference and to learn about other ways to get involved during National Fragile X Awareness Month, visit the NFXF website. What are your favorite ways to raise awareness of FXS? What do you most enjoy about the NFXF conference? We'd love to hear from you. Please consider sharing your story with us. Chris Noronha is a graduate student at UNC's Gillings School of Global Public Health and an intern at RTI International in the Center for Communication Science. His course work and research interests focus on health communication.